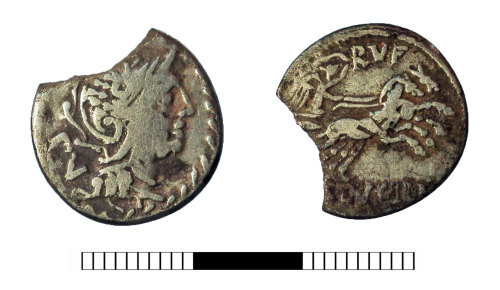 A fragment of a Republican silver denarius of the moneyer M. Lucilius Rufus, dating to 101 BC (Reece Period 1), Helmeted head of Roma / Victory in biga right. Mint of Rome. RRC p. 327, no. 324/1. This coin comes from a large issue with 170 obverse and 212 reverse dies. Republican moneyer: Lucilius Rufus, M.